Tasty dish for every day. Favorable side of the dish is that chop on a pan is prepared fast enough. Wonderful marinade with mustard improves the taste of meat, and the presence of a layer of tomato adds juiciness. Cut each fillet along and beat from both sides. Add salt and pepper, then coat with mustard on both sides. Leave to marinate for 30 minutes. Combine eggs, salt and pepper to taste. Mix it. Dip each fillet in batter and put in a hot pan with oil. Reduce fire below average. On top lay thinly cut slices of tomato. Top — grated cheese. On top lay a little spoon of batter over the entire length. Fry, covered with lid, over low heat till golden crust from both sides. 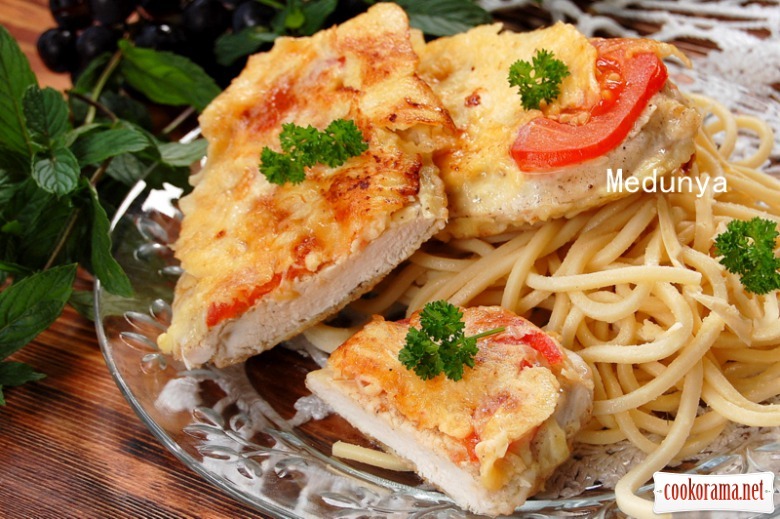 Top of recipe "Chicken chop with tomatoes on a pan"